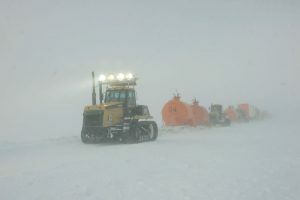 Construction of Concordia required the delivery of some 3,000 Tonnes of equipment and consumables – 4000 Tonnes including the EPICA deep drilling project – while current annual routine operations require the annual delivery of some 500 T. The success of the project has been directly dependent on the capacity to deliver this large quantity of equipment reliably and in a cost effective manner. 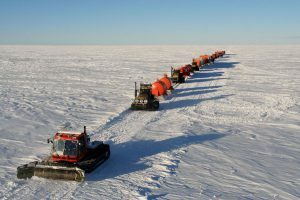 To achieve this, an efficient surface transport system was developed and financed by IPEV and its Italian Antarctic partner ENEA-UTA between Dumont d’Urville / Cape Prud’homme and Dome C, a return trip of close to 2,300km. 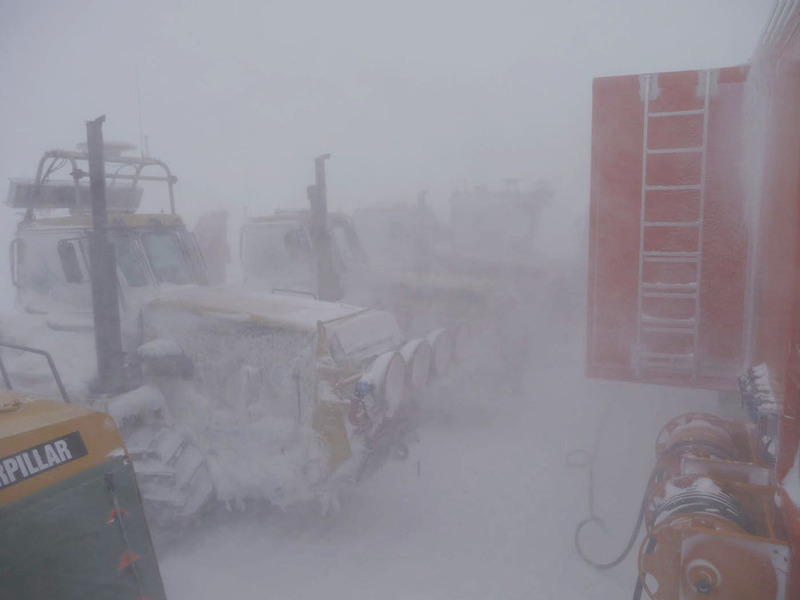 Cargo is shipped by sea from Hobart in Tasmania to Dumont d’Urville, then transferred to Cape Prud’homme, either over the sea-ice in winter or on barges over the water in summer. 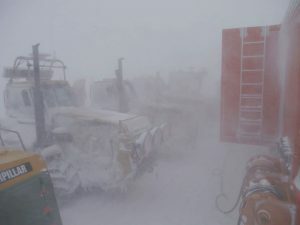 Cape Prud’homme, a nearby coastal site with easy access to the plateau, is the convoy’s formation area where a base camp has been set-up to support traverses. The traverse system is fully operational with three return trips conducted every summer season between mid November and mid February. A typical convoy is composed of 8 to 10 tractors (Caterpillar Challenger) which tow all cargo loads then 2 to 3 snow-grading machines to clear and level the convoy route. Originally designed for agricultural applications, the Challenger was successfully modified for routine traverse use. Each Challenger tows the living vans and a combination of tank and cargo sleds, all of them specially designed for the Concordia project. 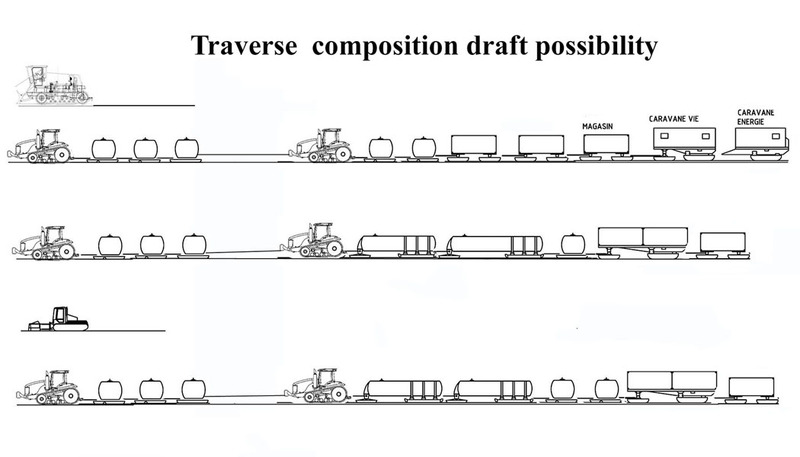 Diesel fuel for both traverse operation and Concordia delivery is transported in bulk in tank-sleds while most dry cargo is in 20 foot containers loaded on 6 and 12m sleds. The average speed of the convoys when loaded is around 11 to 14 km/h. 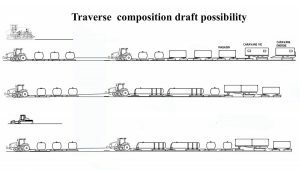 A typical traverse round trip out of Cape Prud’homme takes 19 to 25 days and consumes 75 to 120m3 of Diesel fuel to deliver some 150 to 200 T of net cargo to Dome C.